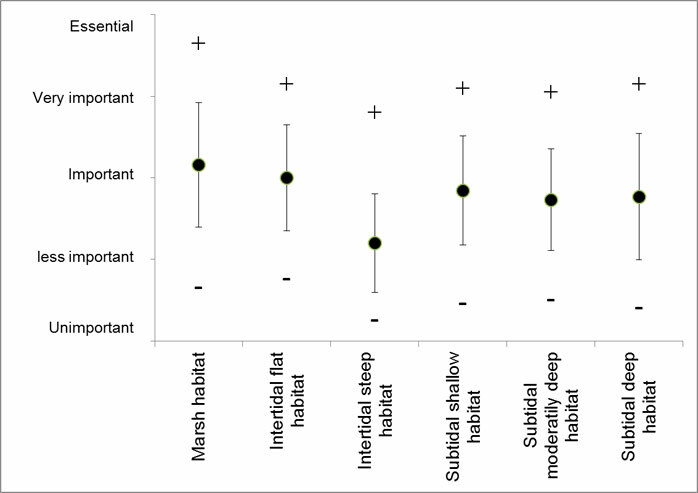 Figure 34: Average importance score of habitats for the supply of the entire bundle of ecosystem services and throughout the TIDE zones and estuaries. 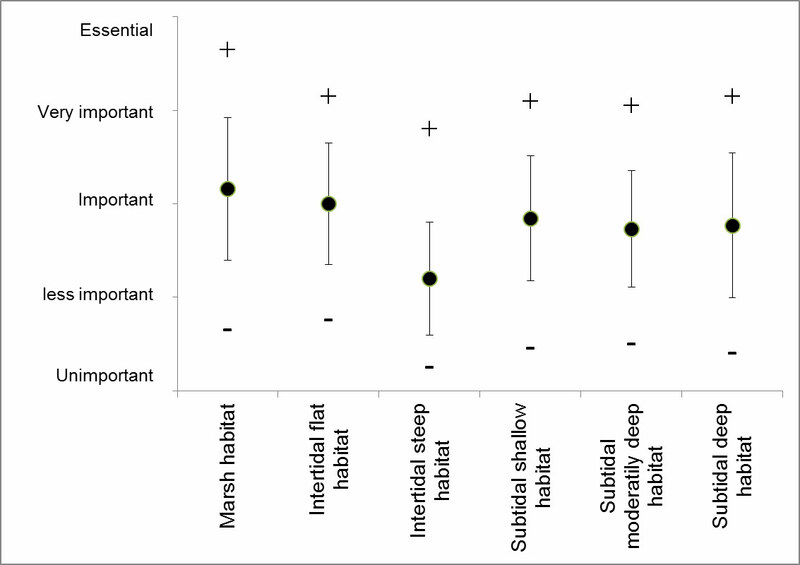 Error bars are standard deviations, - and + show maximum and minimum scores averaged over all ecosystem services. As current ecological management and legislation is mostly using species- and habitat approaches, the contribution of habitats to the supply of the total bundle of ecosystem services is an important aspect to consider. Figure 34 gives an indication of the contribution of each habitat to the delivery of ecosystem services, which can complement information on ecological status, quality and trend in these habitats. This sum is composed of all information on supply for estuaries, zones and ecosystem services (section 5.1 and 5.5). Generally all habitats are important to very important, especially the marsh and intertidal mudflat habitats. Steep intertidal habitats have the lowest importance. This re-affirms that to deliver a full bundle of ecosystem services and benefits to society, all of these habitats are required. As can be observed in figure 25 to 28, an ecosystem services (and by extension the entire bundle) can be delivered by several habitats. However, total supply will be highest if all habitats are present and the proportion of habitats with high delivery scores in the considered zone are larger. Some essential aspects also involved in ES supply are the functional quality of these habitats, and their connectivity. In TIDE, habitats are defined on the basis of elevation in the tidal frame. As is clear from section 5.4, the functioning of these habitats is much more complex. Each service is delivered based on certain abiotic and biotic conditions, while feedbacks and interactions also play a role. This implies that one habitat cannot always be replaced by the other, as the functionality might differ for several services. Also, in a dynamic environment like an estuary, habitats will naturally evolve and shift into other habitats. Naturally, deeper areas become shallow, shallow areas become intertidal and finally marsh habitat due to sedimentation on the one hand, while erosion can shift habitats down in the tidal gradient or maintain habitats at their present state. The need for presence of the entire gradient, combined with the inherent shifts between them due to morphological processes (which are in an important way influenced by estuarine management) is the challenge of a sustainable estuarine management. Shifts in habitat abundance will cause shifts in ES supply, and less habitat or incomplete gradients will result in less supply and consequently, less overall benefits. Translation of directives in rigid surface claims (e.g. EU habitat directive) provide a legislative backup but do not fit a system where the location of these surfaces shifts over time. Optimization of habitat conservation and restoration measures towards ecosystem service supply should therefore target a dynamic mixture of habitat types instead of spatially explicit surface goals for very precise habitats or species assemblages. To complement the explicitly designated and claimed areas by the habitat and bird directives, sustainable estuarine management would benefit from estuary-wide, non-spatially explicit surface claims and (process-based) goals on e.g. rates of (maximal) habitat erosion and (minimal) sedimentation zones, based on specific ecosystem service supply studies as explained in section 5.1 and 5.4. As the ecosystem service approach has demonstrated the importance of all habitats and their dynamic interplay for society, a more equilibrated management can be developed, where habitats delivering more direct economic interests (e.g. deep water habitat) are no longer solely promoted at the cost of habitats which deliver services which benefit long term system functioning (e.g. mudflats, shallow areas,…).